Fountain Square in downtown Evanston. The renovations have caused an increase in foot traffic to the area, said Annie Coakley, the executive director of Downtown Evanston. Renovations to Fountain Square have helped revamp downtown Evanston and increased traffic retail and dining locations in the area, said Annie Coakley, the executive director of Downtown Evanston. 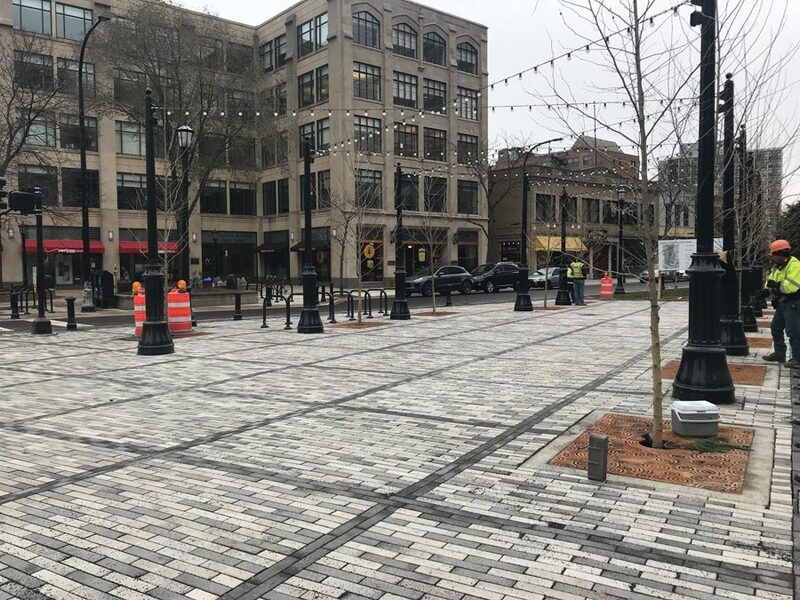 Coakley said the redesigned square — which features seating areas and is set to include an interactive fountain which will be completed by the end of the year — has drawn more residents and employees on their lunch breaks to the downtown area, which benefits businesses in the city. Coakley said the fountain is bringing more foot traffic to the area, which makes it more attractive to businesses. The most successful businesses, she said, are restaurants. In addition to the renovations, a number of new restaurants have opened in Evanston in the past few months, and more are slated to open in the coming weeks. Colectivo Coffee, a chain based in Milwaukee, Wisconsin, is set to open a location on the corner of Church Street and Sherman Avenue, where RadioShack used to be located. Colectivo has 16 shops in Wisconsin and three in the Chicagoland area. The first location dates back to 1993. Coakley said Colectivo is planning on opening its doors in early November. Kilwins, a national candy and ice cream franchise, will open in Evanston in late October. The franchise will be located at 1724 Sherman Ave.
Ron Burnett, chief design officer at Kilwins, said in April that the franchise has about 1,600 recipes ranging from ice cream to “made-in-store items” such as caramel apples and fudge. However, he said each franchise chooses about 300 items tailored to the local community. Other new restaurants in downtown Evanston include 10Q Chicken, a fried chicken restaurant located at 816 Church St., Falcon Eddy’s, a barbecue joint on 825 Church St. and Chicago Hot Dog & Company at 1009 Davis St..
Coakley said in addition to new restaurants, local retail locations — like Uncle Dan’s Outfitters, which moved into the former North Face location at 1600 Sherman Ave. — are thriving in the area. The renovations on Fountain Square have also allowed Downtown Evanston to host more programming, like “Thursday Night Live” music during the summer, which has increased traffic to the area.